The saying "what happens in Boracay stays in Boracay" may not be the case for the celebrities who were seen at the world-famous island getaway. Some had their fans cheering them on; others sparked speculations of romance. And then there were the scandals. At any rate, the Presidential order to shut down and clean up Boracay for six months that started on April 26, Thursday, has put an end to such sightings—at least temporarily. In honor of Boracay's closure, PEP.ph recalls the most controversial fights, unforgettable sightings, and romantic encounters that happened in Boracay. It was the summer of 2006 when Ethel Booba and her cager-boyfriend Alex Crisano had a violent fight that landed them both in Boracay's only police station. Ethel reportedly attacked Alex physically in a fit of jealousy when she saw Alex flirting with an unidentified member of an all-female dance group. According to report, Alex suffered a "bloody" head injury. A year after the incident, on April 6, 2007, Ethel admitted to PEP.ph that she did throw a drinking cup at Alex, but missed hitting him with it. She insisted it was Alex who hit himself on the head when he realized that she was dead-set on physically hurting him. Notorious for their on-and-off relationship, Ethel also clarified that she and Alex kissed and made up two days after that controversial incident in Boracay. The couple eventually broke up for good in June 2007. Anne Curtis had a wardrobe malfunction when she did the opening dance number for ASAP's summer special, that was taped in Boracay on March 21, 2010. It happened when Anne performed a backflip with her dance partner Sam Milby, who was already her ex-boyfriend at that time. He caught her in time for another stunt where he lifted her on his shoulder and made a turn. It was when Sam had put her down that Anne noticed her bikini top had slipped, partially exposing her right breast. Anne felt violated when photos of the accident spread in local tabloids and social media. "Galit ako! Feeling ko nabastos ako," said Anne in an interview with ABS-CBN reporters that was published in a March 25, 2010, PEP.ph article. She added, "Kasi, bakit mo gagawin 'yon? Na walang silang pasabi... although alam naman siguro nila na ang magiging sagot ko dun: hindi. "Kasi katawan ko 'yon, e. Hindi ko naman ginusto yung nangyari. So, nakakasama ng loob na ginawa pa nilang front cover." Her talent management Viva Artists Agency appealed to the media to refrain from publishing said photos. Anne's camp considered taking a legal action against the publications that released photos of her wardrobe malfunction but eventually decided not to pursue the issue. On April 6, 2009, Andrew Wolff was detained by the police in Boracay for nine hours following his reported altercation with a security guard identified as Rodolfo Norbe. According to a police report published on PEP.ph, Andrew allegedly grabbed the gun from Rodolfo's holster, ran away with it and hid inside the office of a nearby bar, Hey Jude. He was subsequently arrested and charged with alleged robbery. In the April 12 episode of ABS-CBN's now-defunct talk show The Buzz, Andrew clarified that the incident stemmed from a mere "misunderstanding." Andrew narrated that he was headed for the second floor of Hey Jude "para po maka-CR" when Rodolfo tried to apprehend him for trespassing. He said he was prompted to engage in a scuffle with Norbe in "self-defense." The robbery complaint filed by Rodolfo against Andrew was dropped when the two parties cleared the air about what really happened that night. Former beauty queens Maggie Wilson and Danielle Castaño were reportedly involved in a "disturbance" at Juice Bar Station 2 in Boracay on the night of April 6, 2009. Maggie was Bb. Pilipinas-World 2007, while Danielle was a Bb. Pilipinas-World 2008 titlist. According to a police blotter obtained by The Buzz, a commotion involving the two beauty queens and two local residents allegedly left Danielle with a wound on her leg and a certain June Vido with a wound on his forehead. The two warring parties agreed not to press charges against each other when they were brought to the police station. However, The Buzz aired a taped interview with the three local residents involved in the altercation, namely: June Vido, Mary Ann Berroya, and another girl who identified herself as Nicole. In the interview, June said he approached Maggie and Danielle's group and asked the women in a "nice manner" to stop making faces at his friend Nicole. Mary Ann said she came to defend June and Nicole and was confronted by Danielle, "Do you know me? Do you know who I am?" Amid the tension-filled moment, Mary Ann's son supposedly felt alarmed and told off Danielle, "Don't talk to my mother that way! That's my mother." Mary Ann said her verbal exchange with Danielle turned into a brawl when her son was dragged into the incident. She recalled in the interview, "Nanginig ako nung nakita na tinulak ang anak ko, e, nagdilim ang paningin ko. I grabbed her and put her on the floor. That's the only thing I did and inawat kami." June also alleged that Danielle tried to throw her purse at him, but that he was able to block it and the purse hit his face instead. Maggie denied the allegations of Mary Ann and June. Speaking via live phone patch on The Buzz, Maggie accused June of picking a fight when he shouted and made false accusations against her and Danielle's group of friends. Maggie pointed out that it was June who allegedly slapped Danielle first. Maggie narrated, "Bumalik ako and I saw Danielle, she hit him [June] with her bag. Kasi siyempre sinampal siya. "He was about to punch her and sinipa ni Danielle si June. Tapos dumating yung Mary Ann. She was yelling at us and asking why we were fighting her friend." When they all ended up at Boracay's police station, Maggie claimed their group filed a police blotter citing June and Mary Ann for starting the fight. "'Tapos biglang lumabas sa news at nagkamali-mali lahat ang istorya. "So, sa akin, okay lang dahil alam ko naman totoong nangyari at nasa police report ang nangyari." On April 9, 2009, a Maundy Thursday, at around 1:30 P.M., SexBomb members Aifha Medina and Rochelle Pangilinan were by the shore listening to songs on their iPod when a male tourist identified as Joshua Formentera reportedly complained about their loud music. It soon escalated into a tension-filled moment when the SexBomb dancers' non-showbiz friend, Michelle "Mitch" Villanueva, called Joshua "bakla." Joshua confronted Aifha first, thinking it was she who called him gay. According to her statement to the police, Mitch said she saw Joshua about to throw a water bottle at Aifha. Joshua then turned his attention to Mitch when she told him it was she who called him "bakla." She related he was poised to hit her with the water bottle when she threw a glass to his face first to stop him. Joshua, however, denied the allegations against him. In an exclusive interview with PEP.ph dated April 13, 2009, Joshua insisted he never threatened or attempted to physically hurt Aifha and Mitch. Airing his version of the incident, he said, "I did have an almost empty plastic bottle of water in my hand at the beach as it was a very hot day, but I never made any suggestion to throw it at anyone." Joshua explained he merely asked the girls to "quiet down" because they presented a "very embarrassing and negative picture of the Filipino youth" to his foreign guests and spouse. Joshua alleged that the girls did not only refuse to keep quiet but their group also allegedly started "harassing" and "shouting abuses" at him. He said it was only when he heard one of the girls calling him "bakla" that he approached them again, but was shocked when Mitch threw a "heavy glass" to his face. Joshua added that he sustained "two deep lacerations" on his face that had to be stitched right after the incident. In a separate interview with PEP.ph dated April 13, 2009, Rochelle said that Joshua confronted her and Aifha's group several times and even shouted at them. Aifha, for her part, pointed out that their non-showbiz friend Mitch already owned up to having caused Jonathan's facial injuries. Aifha also said that she and Rochelle went with Michelle to the police station to give their official statement, but Joshua did not show up to file a formal complaint about the incident. As it was, he was at a clinic getting treatment for his injuries. In an official statement dated April 30, the SexBomb dancers' manager Joy Cancio reiterated their version of the incident. Rochelle and Aifha supposedly turned off their music right after Joshua called their attention. But Joshua allegedly kept on ranting and cussing about the loud music, which irked Mitch. The SexBomb dancers also cited self-defense as the reason why Mitch threw a glass at Joshua. Ten months after the incident, on February 2, 2011, Rochelle told PEP.ph that Joshua filed a legal complaint against her, Aifha, and Mitch. Rochelle also mentioned that she flew to Boracay sometime in early 2011 to attend an initial hearing for Joshua's complaint. But without giving details, Rochelle said Mitch and Joshua were able to settle the matter. Joshua also agreed to drop his legal complaint, Rochelle added. John Lloyd Cruz and Shaina Magdayao caused a stir when they were sighted together in Boracay at a time when their relationship wasn't confirmed. On March 24, 2010, PEP.ph reported that John Lloyd and Shaina arrived in Boracay three days ahead of the scheduled taping for the summer special of ABS-CBN's variety show, ASAP. It was mentioned that John Lloyd and Shaina might have avoided being seen since the luxury resort has its own private lounge at the Caticlan airport and a speedboat for its clients' direct transfer to the hotel. But sources claimed that the two were spotted rolling in their luggage at the lobby of Shangri-La Boracay Resort and Spa on the morning of March 18, 2010. The following day, March 19, the two were reportedly seen getting cozy at the resort's beachfront. John Lloyd and Shaina showed up together for ASAP's March 21 taping. However, when TV Patrol reporter Gretchen Fullido interviewed John Lloyd that same day, the Kapamilya actor refused to comment about his reported "rendezvous" with Shaina. Evading the issue, John Lloyd said, "Ano'ng confirmed [or] denied? Nandito tayo ngayon sa Boracay. So mag-enjoy tayo dito." Then John Lloyd excused himself, saying he did not mean to be rude but that he needed to get ready for his production number. As it happened, John Lloyd finally admitted his relationship with Shaina, "Yes, it's us," in an exclusive interview on The Buzz's June 20, 2010 episode. The couple, however, called it quits in April 2012. On vacation in Boracay in May 2016, Angelica Panganiban accommodated a fan named Xhainelle Perez who requested a selfie with her. To Angelica's dismay, the fan posted their photo with a statement dissing the Kapamilya actress on social media. Xhainelle complained about being "stuck" with Angelica when she'd rather have a photo with her idol Daniel Padilla. In her Twitter post dated May 26, 2016, the Banana Split star posted a screenshot of Xhainelle's Facebook status. Angelica tweeted, "Ay... Sorry ate ha? Pinagtyagaan mo ko. "Sige. Ganito na lang. From now on. ['Di] na ko papayag magpa-picture kahit kanino." Xhainelle deleted her Facebook status and also issued a public apology, saying she did not mean to offend Angelica. In the summer of 2011, Solenn Heussaff was one of the celebrities who was spotted in Boracay during the Holy Week break. She was reportedly spotted in a drunken state and had to be carried by four men back to her hotel at around five o'clock in the morning after a night of partying on the island. In an interview with PEP.ph dated May 1, 2011, Solenn did say that she went out to party with her friends in Boracay. But the Kapuso actress denied the reported drunken incident, explaining she would never make a spectacle of herself on a public beach. "I can drink. But I'm really not bobo, I know the public is watching. "If I want to do something like that, I'll do it in my house na lang. "My family, they don't want rumors like that." Solenn, however, refused to make a big deal out of the issue that came out in a tabloid. "It's so small an issue. I just thought it was weird. I'm not a saint," she said. On May 1, 2015, Carlene Aguilar and her husband, Rogelio Ocampo, reportedly got mobbed during their stay at the Grand Boracay Hotel. In her Facebook account, the Bb. Pilipinas-World 2005 titlist alleged that her husband was beaten up by five men for no apparent reason. She narrated that her "harrowing experience" began at around 1 to 1:50 a.m. when she was bumped by a drunken man on her way to her room on the fourth floor. Carlene related those moments after, inside their room, she and her husband were alarmed by the loud banging and angry shouting outside. They opened their door to check what the commotion was about. To Carlene's horror, three drunken men physically attacked her husband. In her Facebook post, she identified her husband's assailants, among whom was "Tony Tan, the father of the hotel owner." She claimed that one of the two Castro brothers who allegedly mobbed her husband was the one who rudely bumped her in the hotel's hallway. She also wrote that two security guards helped the three men who "manhandled" her husband. Carlene insisted it was Tan who "released the first blow" while the elder of the Castro brothers allegedly hit her husband with a pitcher. "By instinct, my husband who at that juncture was about to be mobbed got a bottle of liquor and used it to ward off the elder Castro, who we heard was hit on his wrist by the bottle." According to Carlene, Tan and the Castro brothers "were all intoxicated" and "shouted" at them to leave the hotel. She added that they immediately left the premises for "safety" reasons and also because she had to rush her husband to a hospital in Kalibo, Aklan, which entailed a "two-hour" land travel from the island. Carlene indicated that her husband's assailants were the first to file a police blotter about the incident since she and her husband immediately left for Kalibo. In a separate report published on the Philippine Daily Inquirer, dated May 2017, it was stated that the mauling incident had yet to be resolved owing to conflicting statements from the two parties involved. The report cited a blotter report filed by 19-year-old Patrick Castro, who identified himself as the guy who earlier encountered Carlene in the hotel's hallway. Contrary to the beauty queen's version of the incident, Patrick claimed that he bumped into Carlene by accident. However, the encounter supposedly triggered a "heated argument" between him and Carlene's husband Rogelio. Patrick claimed that he and his elder brother Mark Castro went to the couple's room to "settle" the matter, but a brawl ensued when Carlene's husband allegedly attacked Mark with a liquor bottle first. The blotter report also stated that Mark was sent to a clinic in Boracay and to a hospital in Kalibo, Aklan, to get treated for injuries that he incurred from the incident. At the time of PDI's report, both parties had not filed any legal complaint regarding the incident. Karylle also reportedly encountered wardrobe malfunction in the same ASAP summer special when Anne Curtis' bikini top accidentally slipped and partially exposed her right breast. Photos of Karylle with her right breast partially exposed were all over the Internet weeks after that episode was shot in Boracay on March 21. In a PEP.ph article dated April 12, 2010, it was reported that a local tabloid also published on its front cover a photo of Karylle's supposed "nip slip." Karylle, however, claimed that the photo was possibly manipulated. While it was true that she experienced an accidental wardrobe malfunction, she said it was "not to the extent" that her right breast would be exposed. In the April 12 episode of The Buzz, Karylle said, "You're singing and you are so in the moment that you become careless and naisip ko lang na I was singing with Arnel [Pineda] on stage. "Sobrang pasasalamat ko lang na kahit papaano I protected myself and wore something underneath." The tabloid that published the article released an official statement, citing its right as a media entity to publish "free and unbiased" content. It also mentioned that the cover story on Karylle's accidental wardrobe malfunction was based on an "eye-witness" account. Karylle, for her part, was saddened by the situation. "Ayoko magalit kasi I just wanna spread the good vibes. Mga ganyang bagay, ayoko pansinin pero siyempre nakakaapekto pa rin." Alden Richards and Maine Mendoza made waves when the Pambansang Bae rented an airplane to surprise Maine during her Boracay trip in 2016. This happened at the height of their phenomenal love team in the highly successful "Kalyeserye" series in the GMA-7 noontime show Eat Bulaga! Maine, who turned 21 on March 3, 2016, went to Boracay with a couple of non-showbiz friends for her post-birthday celebration. She was caught off-guard when Alden turned up outside her hotel room in Discovery Shores Boracay, around 9 a.m. on March 6, 2016, a Sunday. 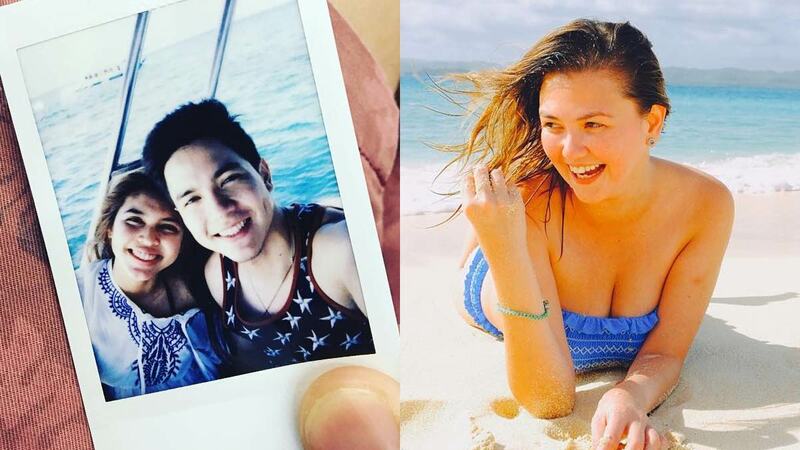 Maine later revealed in her personal blog that two weeks before her Boracay trip, she had invited Alden to join her in Boracay. But Alden informed her via text message—five days before her scheduled flight—that he could not make it because of work commitments. "[A] few days before, he was asking me such things like, 'So yung Sunday yung parang free day natin? Ang balik natin is Tuesday morning?' which led me to the assumption that there's a big chance he'd come. "I didn't respond to his message for I was really sad at that moment. 'Ang aga-aga, Lunes na Lunes tapos ganito mababasa mo?!' I was really mentally shrieking." Maine further recalled that she held on to her "tampo" towards Alden for a total of "six days," even though people around her kept saying that he would find a way to be there for her birthday escapade. And he did make it happen. The duo, along with Maine's friends, had the time of their lives as they went scuba diving, parasailing, jet-skiing, and beach-hopping. According to Maine, her most unforgettable water activity with Alden was when he asked her to ride with him on his jet ski. It happened just as she started feeling "panicky," remembering a past mishap with a jet ski. Recalling how Alden made her feel secure, Maine wrote, "I had this feeling that we might get thrown off into the water, but at that moment, it didn't matter anymore. "I was having a really fun time and for as long as I am with him, getting thrown off would be alright. "I know for a fact na hindi nya ako pababayaan—kahit anong mangyari."